Naked Haunted House Tour? What’s scarier? Sept. 22 – 28, 2013, is Banned Books Week. I’ve long been a fan of banned books, because I figure if someone wants to ban a book, there’s something important for me to learn in it. Understanding others, understanding ourselves, understanding the universe–banned books have grappled with all of these topics and so many more. The harm in that? Fear that the reader may walk away a better person, a changed person with thoughts that those who ban disagree with. Reading is like an outlet plug, forming a direct current of information to your brain. Banning books is like throwing the breaker. 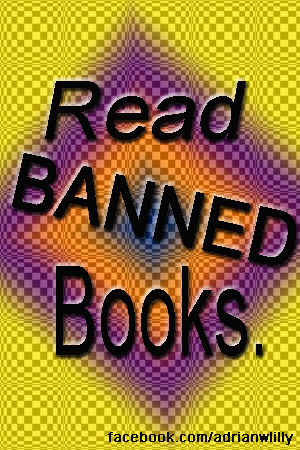 This link is a list of banned books that helped shape America.